Turin is truly one of my favourite European cities to visit. Some say it has echoes of Paris and Vienna about it with its elegant Baroque architecture and silver-service cafe culture. Others suggest it is reminiscent of a golden age of romance with its sweeping porticoes and classic orange tramcars. Personally, Turin (Torino in Italian) reminds me of Britain, or rather 1960s Britain, or rather a movie that is celebrated for capturing 1960s British culture: The Italian Job. 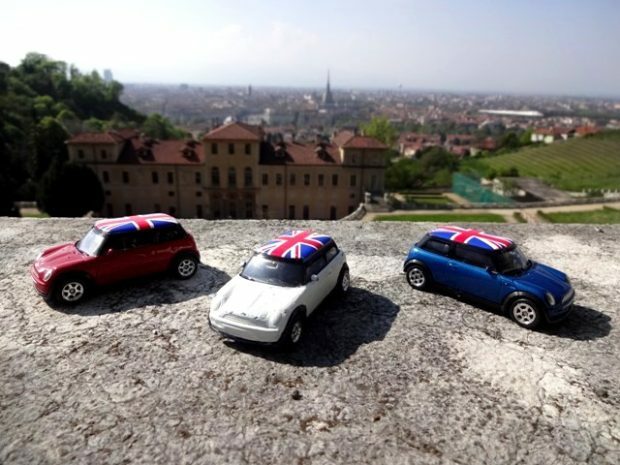 The Italian Job remake using Mini Cooper toy cars. 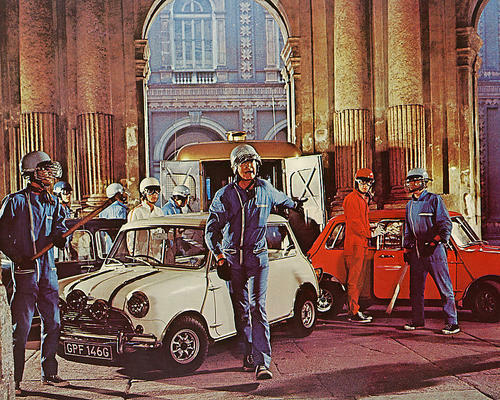 Often cited as one of the best British films ever made, The Italian Job is a classic comedy caper filmed primarily on location in Turin in 1968, and first released in cinemas in 1969. Petty thief Charlie Croker – played by a young and rather handsome Michael Caine – leads a team of hapless cockney crooks through the streets of the Piedmont capital in an entourage of Mini Coopers filled with gold that the gang have just stolen from the city. The gang’s escape is hampered by a citywide traffic jam that they themselves deliberately created to distract the local police and Mafia chasing after them. 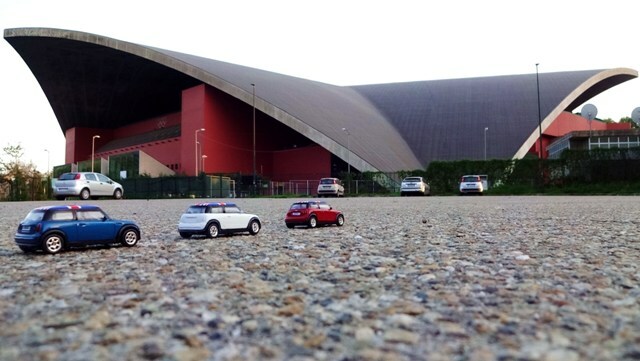 As a result, the route the gang have to take to get out of the city is certainly alternative, with the Minis literally driving through some of Turin’s key architectural buildings and iconic landmarks. 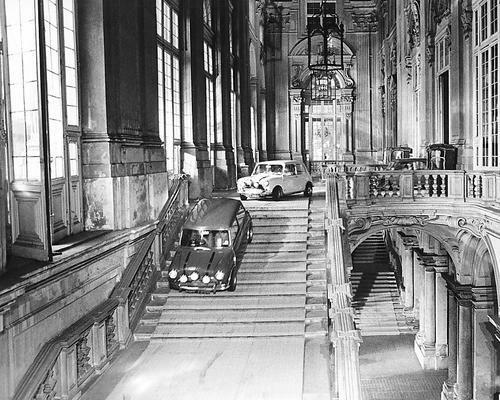 They first drive down (yes, drive down) the beautiful Baroque staircase of the Palazzo Madama, through (yes, through) the Galleriae dell’Industria Subalpina and San Federico, along the crowded porticoes of Via Roma and down into the subway tunnels of Porto Nouva. 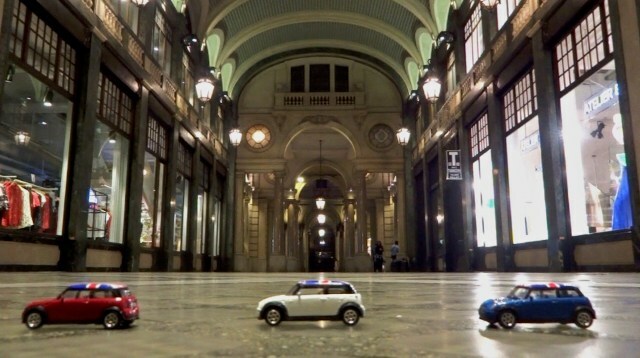 Matchbox Minis passing through Turin’s Galleria San Federico. It was here that the police motorcyclist pursuing the Mini Coopers in the movie, skidded across the freshly washed floor to the annoyance of the cleaner who had just finished washing it. They interrupt a wedding on the steps of the Chiesa di Gran Madre di Dio and are chased onto the iconic sail-shaped roof of the Palavela, before being pursued around the legendary FIAT factory rooftop racing track in Lingotto. On the steps of Chiesa di Gran Madre di Dio. Thankfully, there was no wedding procession to interrupt here the day this photo was taken. The Minis are then seen jumping off the roof in a stunt even Evel Knievel would have probably said no to, before wading through the River Po and finally escaping out of Turin via the underground sewers (although those tunnel scenes were filmed in England). This seemingly impossible, sometimes death-defying and downright cheeky sequence created not just one of the most memorable car chase scenes in cinematic history, but also one of the best promotional films a city could wish for. Yet, it’s surprising that Turin doesn’t seem to make the most of its role in the movie. The Third Man starring Orson Welles, is another great (and far better) British movie, filmed in 1948 on location in Vienna. From the daily screenings, guided tours of the film locations, bars and clubs named in honour of it, and even a museum exclusively dedicated to the film itself, it is clear that even to this day Vienna is very proud of its role in the movie, and has capitalised on it effectively. In complete contrast in Turin, there appears to be a glaring lack of celebration or indeed awareness of the city’s role in a similarly acclaimed British movie starring a huge Hollywood star. Even Turin’s iconic Mole Antonelliana, a beautiful and very distinct nineteenth century building originally designed to be a synagogue but now houses Italy’s National Museum of Cinema, appears to make no reference to The Italian Job whatsoever – certainly not when I’ve visited it – not even in its section dedicated to movies filmed in Turin itself! So, why is this the case? As well as being a firm favourite with Mini Cooper enthusiasts, The Italian Job is also particularly popular with England football fans as it makes numerous references to the beautiful game and glows in the pride of England being the then reigning World Cup champions (the movie was made shortly after England’s only success to date back in 1966). With the latest World Cup tournament taking place in Russia this summer, no doubt The Italian Job will be streamed and watched far more often than usual in Britain during the next few weeks, if only to reminisce over a time when we were the champions (I’ve been told on good authority that it is unlikely we are going to win it again this year). Although we are now generally far better behaved, it is understandable that others may not want to associate themselves with our past laddish football culture, and this maybe one reason why Turin has stayed relatively quiet about its role in The Italian Job. More obviously, The Italian Job is a typically British movie, where the Brits trick, foil and triumph over their enemy, in this case the Italians. The portrayal of Italians in the movie is also admittedly not the most flattering with endless caricatures of Mafia mobsters, bumbling police officers and rotund middle-aged housewives. So, not wanting to celebrate a movie that generally ridicules its own nation and people could possibly be another reason. Yet, the star of the movie is arguably shown in the best and most positive light possible. No, not Michael Caine, but Turin itself. The film portrays and showcases a beautiful, friendly city with a rich culture, stunning architecture and breath-taking Alp-lined landscapes. 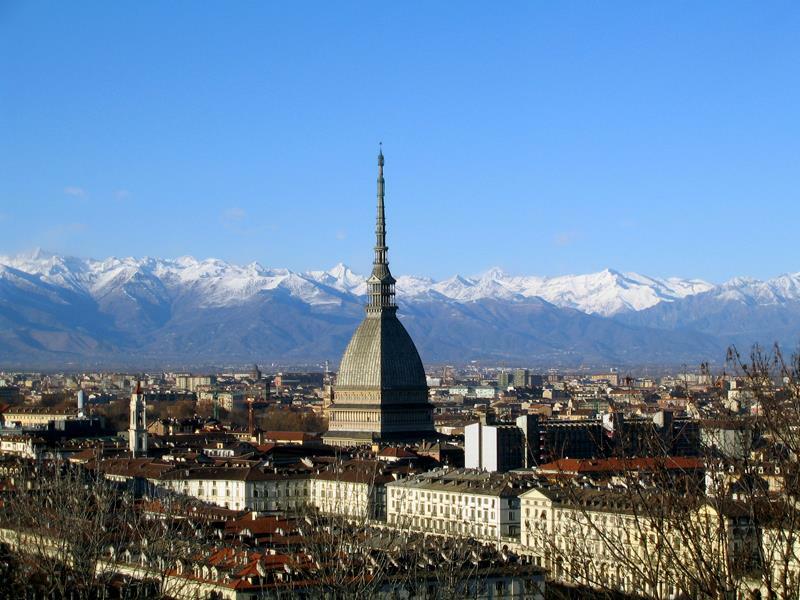 If it hadn’t been for The Italian Job – a favourite of mine for many years – I cannot say whether Turin would have been high on my list of destinations to visit. Thank goodness it was, because on my very first visit there back in 2003 I was taken in by its charm and elegance and, as a result, have visited it numerous times since. In fact my latest visit to Turin was back in April of this year, but it wasn’t just a flying visit. I was there on a mission. Next year (2019) is the fiftieth anniversary of the first release of The Italian Job, and to celebrate this – as well as an excuse to visit Turin again – I decided to make my own film about it. 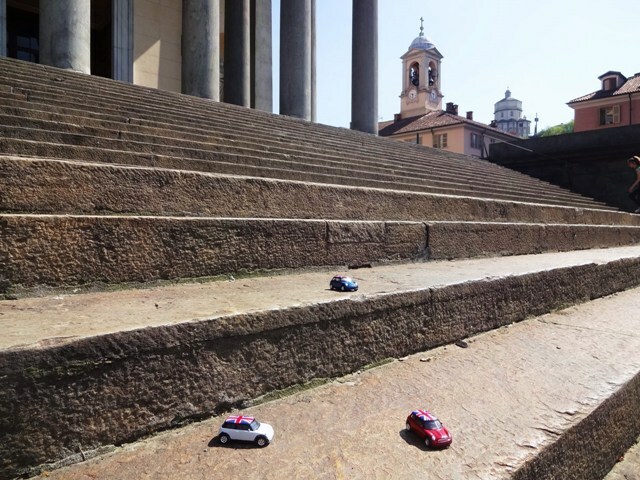 My intention was for it to be an amateur remake using a remote control Mini Cooper toy car and a handful of Matchbox models to recreate some of the key car chase scenes in the very Torinese locations they were originally filmed in. The locals were very accommodating, allowing me to get on with the task at hand, never interfering and never officious. Out of curiosity, some politely enquired what I was up to, although most looked blankly back at me when I mentioned The Italian Job (this general response however, may well have been a lot to do with my dreadful grasp of Italian). Some seemed bemused by a toy car whizzing past them in the porticoes and gallerie, but most were unfazed and even gracious when I accidentally drove the car into the odd passing ankle. One older gentleman evidently did realise what I was up to as he serenaded me with a la-la version of the movie’s opening theme tune ‘On Days Like These’. That touching gesture made my day. For various reasons, my final piece – now uploaded onto YouTube for the world to see (and hopefully to give a ‘thumbs up’) – ended up more as a homage to The Italian Job than a remake, celebrating not just the movie but also the city itself. In hindsight though, that’s how it should have been. The Italian Job may not be held highly in the general consciousness of the people of Turin for whatever reason but, for me at least, there cannot be one without the other. As I’ve already said, if it hadn’t been for an appreciation of The Italian Job, I may not have discovered the charm and beauty of Turin. Yet, without Turin what kind of film would The Italian Job have been? An Americanised version of the film was made in 2003, starring Charlize Theron and Mark Wahlberg. It was set in Venice to justify the use of the original title and presumably to use an Italian city that most Americans would have actually heard of. It is not a bad remake, but personally I feel Venice didn’t create quite the same level of charm and endearment that Turin gave to the original. …and if the Mole Antonelliana is planning an exhibition on The Italian Job next year to celebrate the film’s fiftieth anniversary, then I will book my ticket right away! In the meantime, my remake-homage-documentary to Turin and The Italian Job can be viewed here. Proudly British born and bred, but now travelling on an Irish passport to beat the restraints of Brexit, the lady behind The Lady Travels is a middle-aged wannabe female Michael Palin impersonator seeking the more bizarre, quirky and delightful side of Europe just for the fun of it. She chooses not to reveal her identity within the pages and footage of her media, although the odd limb occasionally strays into shot if an indication of scale or operation is required. The absence of a face and name is done not to create an enigma or any mystery about her but merely to keep the focus on the travel rather than on the traveller, for the former is far more interesting than the latter.